Comtrol has supports MQTT integration in its IO-Link family of products alongside embedded support for the OPC-UA protocol to allows sensor data to be delivered directly into the Internet of Things (ioT) and SCADA control systems. Comtrol has developed a method giving factories and machine builders ultimate flexibility for their applications. Sensor data can now be sent directly to an OPC Client, SCADA software or IoT system through OPC-UA or MQTT database connections integrated on Comtrol’s IO-Link block. Users can also simultaneously control devices from the PLC or another controller using Ethernet/IP, Profinet or Modbus TCP. “Comtrol is excited to be able to provide direct sensor connections to IOT systems through our IO-Link Master. Customers now have a choice to bypass the PLC or work together with the PLC system. Comtrol’s IO-Link technology with OPC UA and MQTT gives users access to complete sensor data without the hardware and software costs associated with PLC systems,” says Bradford Beale, President of Comtrol. Comtrol sells RocketLinx industrial grade Ethernet and Power over Ethernet switches, IO-Link Master industrial gateways, DeviceMaster Ethernet device servers and gateways and RocketPort multiport serial cards. The Holst Centre and Fraunhofer FEP in Germany have developed a flexible OLED screen that is 15m long. The development is part of the Lyteus project that brings together OLED technology developers across Europe to create a pilot production line and product development services. "This is a major milestone in development of pilot line Roll-to-Roll (R2R) technologies that will enable Lyteus to offer long OLED strips to its customers. It is an example of how the Lyteus pilot line turns flexible OLED possibilities into products. It was only possible due to the unique capabilities of Holst Centre and Fraunhofer FEP and the great cooperation between them and other Lyteus partners" says Pavel Kudlacek, Leader of Technology Development at Lyteus. To produce the device, Fraunhofer FEP deposited an indium-tin oxide (ITO) anode onto a protective multi-layer barrier film produced by Holst Centre. The roll was processed at Holst Centre, where slot-die coating was used to structure the anode and deposit the first layer of the OLED stack. Fraunhofer FEP then evaporated the rest of the OLED layers and finalized the devices by lamination of Holst Centre barrier. The resulting devices have a good homogeneity and an efficacy of 15 lumen/W at a light output of 1000 cd/m2. "Roll-to-roll production promises higher volumes and lower costs for flexible electronics applications like OLEDs. At Holst Centre we have been developing a unique, solution coating roll-to-roll line for 10 years. The 15-meter OLED shows that the technology is now ready for industrialisation, and can deliver cost-effective, high-volume OLED production," says Pim Groen, Program Manager at Holst Centre. "The 15m OLED is further evidence of our ability to deposit high-quality organic layers and integrate them with a unique solution-processed layers to create reliable and homogeneous devices in a continuous process. It is a step towards the creation of 'endless' OLED devices and a further step in our R2R OLED manufacturing processes, which we are developing now for more than 10 years," says Jacqueline Hauptmann, Project Manager OLED R2R at Fraunhofer FEP. Qualcomm has dropped in the rankings of top fabless chip design houses after its failed bid for NXP, being overtaken by a resurgent Broadcom, according to the latest Q3 figures by TrendForce. The other nine companies in the top ten all registered year-on-year growth in their revenue, driven by segments like networking, data centre, automotive application and consumer electronics. Nvida also showed 32% overall growth to take the number 3 slot, benefiting from strong momentum in segments like gaming, professional vision, data center and automotive applications. Particularly, a remarkable revenue growth of 65.3% YoY was recorded for Nvidia's data centre IC business in the third quarter. “Qualcomm has adopted an aggressive product strategy, introducing five new processors with different market positioning by the end of the third quarter,” said senior analyst CY Yao from TrendForce. The slowdown in the global smartphone market has resulted in lower prices, leading to a drop in Qualcomm’s revenue. Following Nvidia, Marvell registered the second highest revenue growth after the acquisition of Cavium to grow 28.2%, surpassing Xilinx. Taiwanese design houses MediaTek, Novatek, and Realtek all showed significant growth from demand from consumer electronics makers for the upcoming holiday sales. MediaTek has recovered from the revenue decline since the second quarter this year and grew by 3% in the third quarter. Mediatek has allocated more capacity to its products on 12nm process and improved the cost structure of processors. It turned out to achieve a gross margin of 38.5% in the third quarter, the highest quarterly margin since 2016. On the other hand, Novatek’s SoC products received wider market reception, benefited from the favorable demand from global TV market. As for Realtek, it showed a growth of 7.9% YoY in the third quarter, driven by the growing networking market in China and the coming of year-end sales. Mitsubishi Electric and NTT DOCOMO have have shown the world's first 5G proof of concept for 27Gbps and 25Gbps maximum throughputs via one mobile terminal over communication distances of 10m and 100m, respectively, using the 28GHz radio frequency. The demonstration in Japan was conducted during joint outdoor field trials using 28GHz-band massive element antenna systems and 16-beam spatial-multiplexing technology with 500MHz bandwidth. For outdoor trials using the 28GHz band, Mitsubishi Electric used an antenna system with 16-beam spatial-multiplexing technology . Base-station antennas installed on the wall of a building directed beams to mobile-terminal antennas installed on the rooftop of a vehicle and showed successful wireless downlink transmission at maximum data rates of 27Gbps and 25Gbps for per one mobile terminal when the communication distance was 10m and 100m, respectively. The 16-beam spatial-multiplexing technology consists of eight analogue, front-end processing, low-power units to form 16 beams and a multiple-input multiple-output (MIMO) digital processing algorithm to reduce inter-beam interference. Conventional 4G spatial multiplexing technology has limited multiplexing order, so Mitsubishi Electric and DOCOMO developed beamforming technology in an analogue domain and inter-beam interference reduction technology to suitably separate overlapping beams with digital signal processing at the base station. The result is 16-beam spatial multiplexing, which has been unachievable with 4G. The developed beamforming technology enables beams to track a mobile terminal by switching the preset beam and the inter-beam interference reduction technology estimates the channel at the base station and controls the transmitting signal to adaptively reduce inter-beam interference as channel conditions over time. Together, the two technologies enable 16-beam spatial multiplexing in outdoor mobile environments. The achieved peak data rates correspond to spectral efficiency of 67bps/Hz4 , believed to be the world’s best performance for 28GHz-band mobile telecommunication. This is expected to enable wireless communications at ultra-high data rates of more than 20Gbps to moving vehicles with numerous passengers, such as buses. German embedded board maker congatec has teamed up with a major maker of industrial cameras to provide integrated x86 and ARM embedded vision applications. The first system developed with Basler is a smart embedded image recognition platform for face detection is based on Basler's dart camera module with USB 3.0 and conga-PA5 Pico-ITX boards with 5th generation Intel Atom, Celeron and Pentium processors. Further kits based on congatec boards and Basler modules with MIPI-CSI, GigE vision or other relevant interfaces will follow. The pylon camera software suite will also be integrated by congatec as standard software into appropriate kits. "Over the next few years, more and more embedded vision solutions will appear on the market. They will be smaller, lighter and more tightly integrated designs at the embedded computing level. They will allow previously stationary vision applications to become mobile or portable. Embedded vision will also help to implement existing vision systems more cost-effectively, and open up new fields of application that today cannot yet take advantage of camera technology," said Alex Temme, General Manager Module Business at Basler. "Due to the increasing demand for board-level camera technology in and on equipment, machinery and systems of all kinds, it is essential that Basler's driver packages for sensor control and image acquisition are optimally harmonized with our embedded boards and modules. We will now ensure that this is the case from day one of our technology partnership with Basler," said Christian Eder, Director Marketing at congatec. AUTOSAR (AUTomotive Open Systems ARchitecture) has released the latest version of the Adaptive Platform that incorporates the embedded publish/subscribe Data Distribution Service (DDS) standard. Release 18-10 supports a full network binding of DDS, allowing automotive manufacturers to implement an AUTOSAR Adaptive framework with DDS and develop highly autonomous systems, such as Level 4 and Level 5 autonomous vehicles. RTI worked with the AUTOSAR Consortium on the implementation, as both the DDS and AUTOSAR standards contribute to a robust ecosystem for autonomous systems. DDS enables AUTOSAR to fully support highly autonomous systems with a production-ready communication framework that delivers the reliability, scalability and performance needed for these complex systems. The AUTOSAR Adaptive Platform is a software standard designed to meet the increasing technology demands of new automotive applications. DDS is being adopted by Automotive Original Equipment Manufacturers (OEMs) as a framework to solve complex requirements in Level 4 and Level 5 autonomous systems. In the AUTOSAR Adaptive platform, the DDS components are optimised for end-to-end data sharing with little to no custom integration required. As a result, the DDS-based technology eliminates complex integration and security challenges for OEMs by providing a data-centric interoperable framework that supports all of the operating systems and processor architectures commonly used by OEMs and their suppliers. Auto manufacturers can also leverage other technologies outside of the AUTOSAR specification including cloud-based and back-end systems, as well as additional components that are common within the automotive industry, such as MatLab and Simulink as well as DSpace, Linux and QNX platforms. STMicroelectronics has launched a coin-sized development kit for nodes in the Internet of Things (IoT). The BlueNRG-Tile is built around ST’s BlueNRG-2 Bluetooth low energy 5.0 single-mode system-on-chip (SoC) that provides control and processing power to a full complement of sensors, while also communicating via Bluetooth with a free iOS or Android demo app on a nearby smartphone. For multi-node applications, the BlueNRG-2 SoC, which is powered by an Arm Cortex-M0-core with up to 256KB of embedded flash memory, supports mesh networking up to 32k nodes, substantially extending the range of sensing and remote monitoring to any needs, from smart-home to large-scale industrial infrastructure. Surrounding the BlueNRG-2 SoC, ST has packed a full-featured ultra-low-power sensor portfolio, which includes an accelerometer and gyroscope, a magnetometer, pressure, and humidity and temperature sensors, a microphone, and a FlightSense Time-of-Flight sensor. With a highly optimised sensor architecture, the BlueNRG-2 SoC specs just 900 nA sleep current (with full data retention) and full-system stand-by power as low as 25uA. More notably it also achieves ultra-fast wake-up capability, efficient execution of 9-axis inertial sensor fusion (running the ST MotionFX sensor-fusion code optimized for the Arm Cortex-M0) and streaming of real-time, low-latency data consuming just 1.4mA at 25 Hz. The kit is accessed for programming and debugging through a motherboard that together with the tile/coin compose an Eval kit, offers a convenient on-board debugging and programming interface, multi-colour LED, and a configurable wake-up push-button. The Software Development Kit (SDK) comes with BlueNRG-Mesh networking library, MEMS sensor algorithms including 9-axis sensor fusion and event detection, voice-over-BLE code and a bunch of ready-to-go examples in source code. In addition, ST BLE Sensors and ST BLE Mesh apps, for iOS and Android smartphones and for both mesh and point-to-point networking, are available for download from the app stores. The MEMS sensor and the highly integrated BlueNRG-2 SoC, together with a size-optimised RF balun, have allowed ST to squeeze the coin’s size down to 2.5cm diameter. Distributor RS Components has added blockchain and IoT capabilities to its DesignSpark Zerynth Studio middleware toolkit. This will allow members of the DesignSpark engineering community can now use Python to program microcontrollers for blockchain and Internet of Things (IoT) applications through the DesignSpark Zerynth Studio suite, which is available to download free of charge via a portal on the DesignSpark website. The Zerynth Studio toolkit enables fast IoT application development, with high-level standards of security, as developers can program in Python or a hybrid C/Python language on the most popular 32-bit microcontrollers and connect them to cloud infrastructures. The move opens up the use of Zerynth for IoT applications and embedded development to the huge community of programmers who use Python, a powerful programming language, which is widely used with the highly popular Raspberry Pi single board computer, for example. The extension of the DesignSpark Zerynth Studio middleware toolkit is made possible with the introduction of the open-source Zerynth Ethereum Library. It allows microcontrollers to generate and sign Ethereum transactions based on just a few lines of Python. Ethereum is an open-source distributed-computing platform that generates the blockchain for the Ether crypto-currency. The Ethereum library therefore provides developers with easy connection to the Ethereum blockchain and to use smart contracts and seamlessly integrate IoT devices with decentralised applications (DApps). The ability to generate, sign and send transactions from a microcontroller enables any device capable of running the cryptography algorithms to directly take advantage of smart contracts, which deliver credible and trackable transactions, thereby removing the need for centralised gateways as well as avoiding possible points of failure. Zerynth launched through a successful Kickstarter campaign in 2015, originally under the name VIPER, with the aim of providing professional development tools for embedded and IoT applications in Python. The tools simplify IoT development, providing an easy and efficient way to program the most popular 32-bit microcontrollers in Python and connect them to the top Cloud infrastructures like Microsoft Azure, Amazon Web Services, IBM Bluemix, and Google Cloud IoT. The Zerynth Ecosystem consists of Zerynth Studio, Zerynth Virtual Machine, Zerynth Advanced Device Manager and Zerynth App. Zerynth has been listed as a Trusted IoT Platform Partner by Microchip as a genuine security expert on Microchip technologies. Zerynth has also formed numerous partnerships with companies like Espressif Systems, NXP, Amazon Web Services, Google Cloud Platform, RS Components, Mouser Electronics, XinaBox, Eseye, MikroElektronika, Riverdi and more. The DesignSpark Zerynth Studio middleware toolkit for Windows, Mac and Linux is available to download for free from https://www.rs-online.com/designspark/zerynth for all new and existing members of the DesignSpark community. Keeping data such as health records secure for decades is a major challenge. Researchers from the Collaborative Research Centre at the Technical University in Darmstadt (Germany) have developed a system that will ensure decades of safe storage for sensitive health data in a joint project with Japanese and Canadian partners. The system will go into trial operation in Japan in the coming weeks. A major challenge are the technological developments that will occur over this extended time period, as these have an enormous impact on the security of existing cryptographic schemes. “All encryption methods used today will become insecure over the course of the next few years and decades”, explains Professor Johannes Buchmann at the Collaborative Research Centre. “The attackers’ computing power will increase and their attacks will improve. Therefore we can assume that all encrypted data will be compromised in 20 years if not sooner”. Canadian company ISARA, the industrial partner of the project, protects the data during transfer between the hospital and the server operators with quantum computer-resistant encryption. This is the third component of the LINCOS system. In the future, the researchers want to add yet another level of security that they have already realised in prototype with the Japanese team: quantum key exchange. This procedure guarantees sustainable secure keys, since it is impossible for an attacker to intercept the key exchange. More than 65 scientists from cryptography, quantum physics, system security and software engineering work at the Centre, as well as a team in the quantum laboratory at TU Darmstadt. “The sustainable protection of electronic health records is only one example of areas where sustainable security is urgently needed. In our digitised world, we produce an unimaginable amount of sensitive data every day, which must remain confidential and unchanged over a long period of time, for instance in the implementation of Industry 4.0 which is crucial to Germany as an industrial nation. Policymakers are called upon to ensure the guaranteed long-term protection of our data,” said Buchmann. 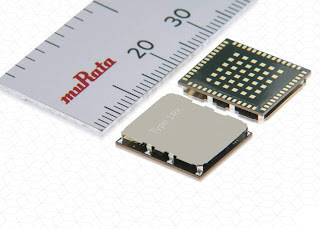 Murata has laid claim to the world’s smallest narrow-band IoT (NBIoT) cellular wireless module. The LBAD0ZZ1RX measures just 15.6 mm x 14.0 mm x 2.2 mm, is fabricated on a PCB with a metal casing, and is designed for use in compact, battery powered IoT/IIoT applications. The module integrates a HiSilicon Hi2115 single-die wireless SoC device that provides the radio transceiver, baseband and application processor functions with a ten year battery life. The module also hosts a DC-DC converter, a power management IC, wireless front end matching components such as baluns and low pass filters and an RF switch. The HiSilicon Hi2115 includes an Arm Cortex M0 processor core running at 40 MHz and equipped with 64 kBytes of SRAM and 256 kBytes of Flash that controls module communications using the industrial standard AT command set. The module features a comprehensive set of peripheral interface functions including UART, I²C and SPI along with GPIO and an ADC. The module conforms to the NB-IoT 3GPP release 13 narrow-band standard and can operate in the low and middle bands. Mass production is scheduled for Q1 2019. Researchers at CSEM in Switzerland have developed the world’s first fully autonomous camera that can be deployed like a sticker, opening up new possibilities for sensors in the internet of things (IoT). The patented Witness IoT camera is solar-powered and includes a specially designed CMOS image sensor consuming less than 700 microwatts. Future versions will include VGA resolution as well as embedded face recognition. CSEM has used its experience in the design and development of ultra-low-power microsystems to develop a fully autonomous portable camera that can be deployed quickly and easily via an adhesive patch or magnet. The patented Witness IOT camera measures 80 x 80 mm and 4mm thick, consuming less than 1mW of power in active mode that comes from a flexible, high-efficiency photovoltaic cell with an adhesive surface. A high-dynamic range (120dB) CMOS image sensor consuming less than 700uW @ 10 fps for 320x320 pixels includes intelligent embedded software allows triggering by scene–activity detection. The camera records fixed images at 1fps and stores them in flash memory for later USB readout. TE Connectivity has launched a series of NanoRF modules and contacts that double the density of today’s VITA 67 RF modules for VPX embedded computing applications. The high frequency nanominiature coax contact is engineered with smaller contacts and a higher RF contact density within a multi-position module. This design enables smaller packaging and saves valuable space. 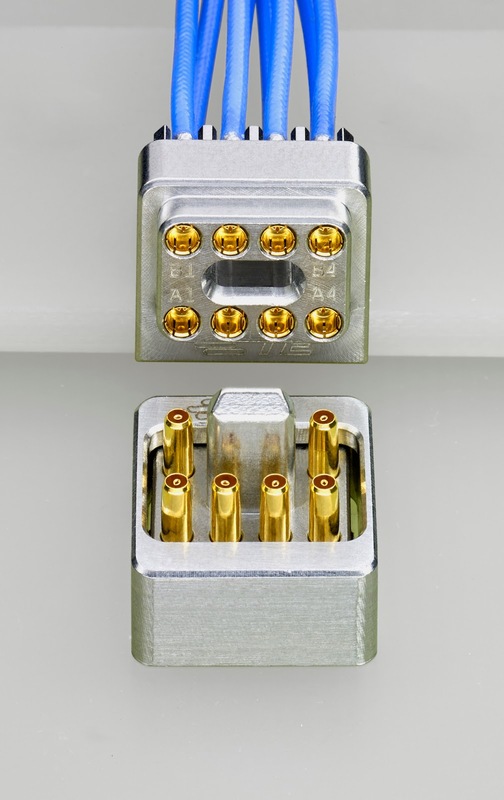 Half-size modules can support up to 12 RF contacts and full-size modules can support 18 contacts or higher, with the option to customise contact count and position. The blind-mateable, float-mounted backplane contacts support module-to-module or box-to-box architecture. 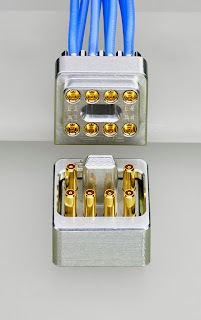 While they are designed for 0.047-inch coax cable, multiple cable types are available to fit the application’s needs. To bring high frequency capability into a high density modular package, the contacts support frequencies up to 70 GHz. The NanoRF features a floating insert on the backplane side, with guide features to pre-align the array of contacts before they engage. This results in reliable mating and consistent RF performance up to 500 mating cycles.